So you’ve selected the best frame for your print, photo, art work or sporting memorabilia. We’ve completed the order and now all you have to do is hang it. When it comes to hanging a frame there are many different products available but it doesn’t have to be complicated. This article highlights different hardware you can use to hang your frame. Top Frames will provide you advice for your needs. One thing to remember is that using only a screw or nail driven into the wall is not ideal for holding your frame and may cause damage to your frame and artwork. For the elegant art gallery look we suggest a picture rail system. This system suspends a picture hook from the track (sometimes called the rail) attached near the cornice of wall, allowing you to set your frame at any point on the wall. It means no more nails in the walls, plus you will be amazed how quickly you can adjust it to your changing needs. We stock two brands of hanging systems: one produced by Gallery Systems and another by Artiteq. One advantage of the hanging systems is that it can be installed on any wall, whether masonry, plaster or timber. Other hardware options are often specific to the type of wall. We stock a limited supply of general picture hangers but will help find the right one for you. The flexibility of the gallery style hanging system is its major advantage. Whether you have a new picture or want to rotate the art works you already own, you can make changes without having to put another hole in your wall. 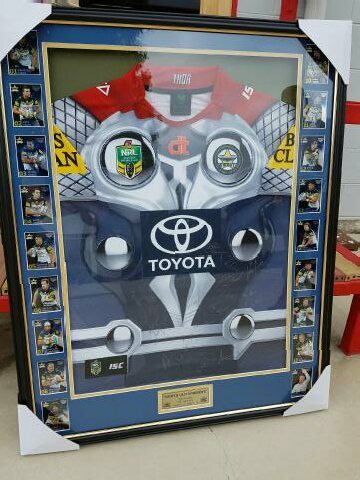 Having a framed jersey on your wall is a great way to show your support for your favourite team. 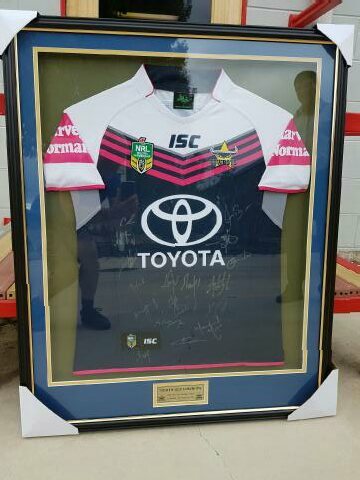 We often get phone calls asking how much it is to frame a jersey. The price of framing anything will depend on the size and framing materials you need. We do however offer a ball park figure. You can have your jersey framed for $350. This will get you something similar to the picture below (this one with the addition of $30 plaque mounting). Jersey mounted on a single matboard with a standard black frame and white timber shadow box frame. This product with additional plaque mounting is $380. But, you don’t have to stop there. You can add plaque, photo or game ticket. You could add an extra matboard to display more of your team colours or use conservation framing materials to preserve it. There are various possibilities! Come in to Top Frames or contact us today. Conservation framing is the presentation of art, photographs and other memorabilia in order to protect them using material and methods which prevent damage. The process uses techniques which are reversible so that the artwork, photograph or object is unharmed if it needs to be removed from the frame. Damage to art, photographs and memorabilia can occur without your knowledge. Two common slow processes which cause damage are acidic materials and UV bleaching. Acid damage can make artworks and photographs brittle and cause the yellowing of white papers. The lower the quality of paper the more likely it will discolour. If you think of an old newspapers, it discolours quickly as they are designed to be disposable. UV bleaching will also change the colour of the artwork, photograph or object. The dyes and ink used will usually bleach out at different rates depending on their chemical nature. For example some photo will fade to red others will fade to blue. These risks can be controlled through choices available to you at Top Frames such as UV Glass, Acid-Free Backing and Acid-Free Matboards. Picture framing glass comes with a UV rating expressed as a percentage of UV light blocked. We offer many different glass products to suit your needs. Of those that block a high percentage of UV light we recommend TrueVue UltraVue glass as it presents no reflection and blocks 70% of UV light. If you are looking to block 99% of UV light we recommend using TrueVue Muesum Glass. Top Frames uses acid-free foamboard as standard backing. Our foamboard has a high density polystyrene core and is covered on each side with a pH neutral matte surface paper. This provides physical protection and an acid-free surface. We can provide AlphaRag acid-free matboards which are 100% cotton and museum quality. These matboards are pH neutral and come in a full assortment of colours which allows you to present and protect your artwork, photographs or memorabilia. 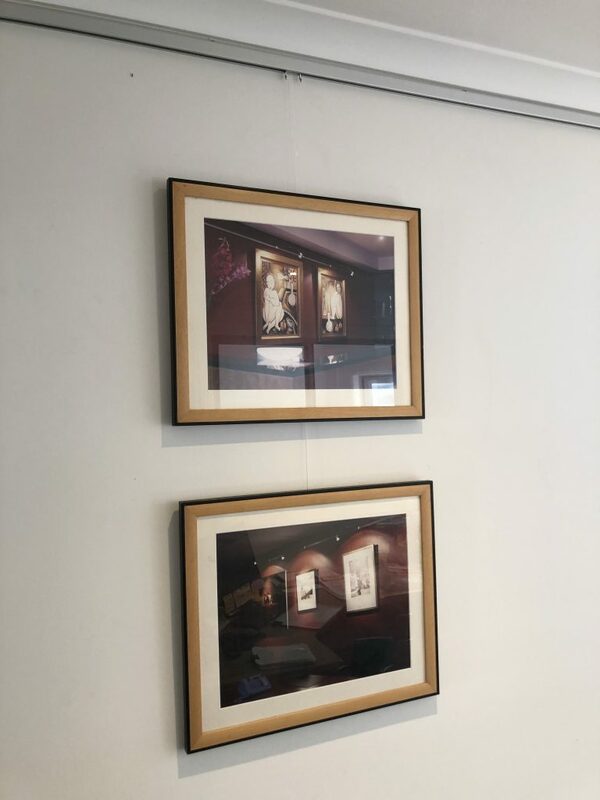 We can provide obligation free quotes for both standard framing and conservation framing for you to consider protecting your artworks, photos and memorabilia.